Sam Allardyce has been sworn in as the 14th full-time manager of West Ham United. Following weeks of speculation, the official site announced this morning that 'one of English football's most prominent managerial names' has put pen to paper on a two-year contract. Allardyce has taken charge with immediate effect and spoke straight away of his desire to get the Hammers back into the Barclays Premier League at the first attempt. With full backing from the Board, he intends to sign several players to achieve that ambition and has pledged to instil 'a winning mentality' from day one at the Boleyn Ground. He said: "It is an honour to be the new manager of West Ham United. It is a fantastic club with a great tradition and loyal supporters who deserve to be in the Premier League. I can't wait to begin pre-season training as I am determined to get this club back where it belongs." Pride and passion will be watchwords for the new Hammers boss, with Allardyce saying there was no post out there "that excites me like the prospect of managing West Ham". The 56-year-old added: "I wouldn't have taken this job if I didn't think we could bounce straight back into the Premier League. More than that, I wouldn't have contemplated the job if I didn't think there was the opportunity to build something substantial at West Ham." Giving his first West Ham interview to Talksport, the new Hammers boss admits it's a big task to be done but one that inspires him a great deal because of the status and the history of the club. "It's magnificent, and it's probably one of the biggest clubs I've had to manage," he said. "Newcastle was perhaps slightly bigger with its fan base but West Ham? Great potential, a great opportunity to really further my career and do my very best in the first year to get them back in the Premier League. Then the ultimate move to the Olympic Stadium, which is a very exciting prospect indeed. That's why I'm taking it, I wouldn't take it under any other circumstances. I've got to get in and get the job done. I've got a two-year contract so I've got two years to do it. But my ambition is to do it in year one; with the experience I've got, my relationship with the players and the support from my chairmen hopefully we'll achieve that in the first year." The 56-year-old replaces Avram Grant, who was axed minutes after West Ham's relegation was sealed by a 3-2 defeat at Wigan a week before the end of the season. Allardyce, who has been out of work since his surprise sacking by Blackburn's new owners in December, has reportedly been offered a huge bonus if the Hammers are promoted next term. The appointment will not be met with much enthusiasm with many West Ham fans turned off by his direct style of play. But Sullivan and Gold have opted for pragmatism over sentiment with Allardyce having taken Bolton from the Championship into Europe during his highly successful eight year spell at the Reebok Stadium. Wolves fan Allardyce was a tough-tackling defender who enjoyed a 400 game playing career that spanned 11 clubs over the course of 19 years; including 63 appearances for Millwall between 1981 and 1983. He first entered management in 1992 with League of Ireland outfit Limerick, having spent two years as assistant to Brian Talbot at West Brom. His first full-time appointment in England was with Division Four side Blackpool. After two years learning his trade with the Tangerines, Allardyce - who was sacked despite reaching the play-offs - moved to Notts County in January 1997 with the club in deep trouble at the foot of the (old) Second Division. He arrived too late to save the club from the drop and County were relegated having won just seven of their 46 league matches, finishing bottom of the table. However the following season - 1997/98 - Allardyce led the Magpies back to Division Two, winning the league by a massive 17 points having secured the title by March of that year - a feat not achieved since the Second World War. His success at County alerted Bolton, managerless following Colin Todd's resignation in the Autumn of 1999. Allardyce was delighted to accept Wanderers' offer to succeed Todd, having spent two seperate spells with the Trotters as a player between 1973-1980 and 1985-86. His eight years at the Reebok Stadium were an unprecedented success, beginning when the Trotters gained promotion to the Premier League at the second attempt having made the play-offs in Allardyce's first season back at the club. A 3-0 play-off final win over Preston in 2001 signalled a return to the top flight where Wanderers went on to finish in the top eight of the Premier League in four successive seasons. 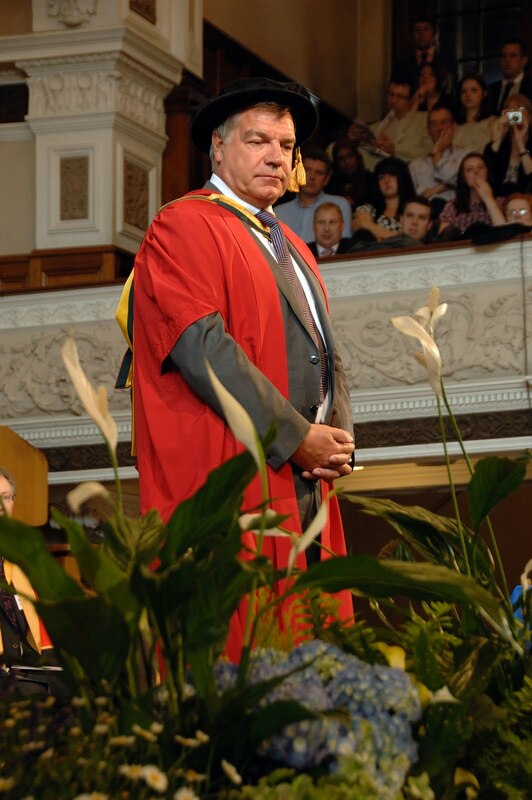 Allardyce's vast knowledge of the game, respected coaching credentials and innovative approach to sports science led to him being linked with the England job on several occasions. After eight years in the North West, and having taken the club as far as he felt was possible given their limited resources, Allardyce decided to move to pastures new in 2007 and attempted to recreate his Bolton success at Newcastle - a poisoned chalice for many managers over the years. His tenure on Tyneside was to last just seven months; having failed to meet unrealistic expectations, Allardyce was fired in January 2008. Later in the year, Big Sam was appointed manager of Blackburn Rovers after former Hammer Paul Ince was sacked. Despite rallying his troops to a tenth-place Premier League finish he was fired for a second time, two years into a three-year contract by new owners Venky's. The circumstances surrounding his departure remain shrouded in mystery. Since then Allardyce has been linked with a number of vacant positions and was initially considered a front-runner for the West Ham job back in January, when Avram Grant's job was first considered untenable by West Ham's owners David Sullivan and David Gold. With a botched move for Martin O'Neill behind them West Ham's board finally sacked the hapless Avram Grant two weeks ago, since when Allardyce has been hotly tipped as the Israeli's replacement. Allardyce, who will earn an annual salary of around £1.25m, plus a £1m bonus if he wins promotion, will spend the next month honing his new squad and identifying players that can help him achieve his aims. He stated he is committed to using the best Academy talent in tandem with high-quality experienced performers that will be up for the battle ahead in a competitive Championship. "There is a core of very talented young players at the club who've come up through the youth system, have West Ham in their blood and who I know I can build a successful team around," he said. "That's what I'm looking forward to, managing a club that wins more games than it loses and competing at the top of the table. We need to create a winning mentality and give the fans a team they can be proud to watch." In his interview with Talksport, the Dudley-born Allardyce admits it will tough be to keep the side’s leading players in east London. He told the Keys and Gray Show: "I don’t know if I’ll be able to keep Parker. We’ll have to wait and see but it looks like it will be difficult. I’ve not spoken to Scott about it, but I’ve talked to David Sullivan and there have been no indication of bids for him yet. There will probably be an exodus of top players for financial reasons. There’s a dramatic loss of revenue, even with the parachute payments. It's still a massive loss and you have to adjust like every club has to adjust when they've fallen out of the Premier League. But for me, whatever happens with some of the good players there'll still be the basis of a very good squad and there's some very good young players at West Ham to enable us to rebuild very quickly." Allardyce explained the club needed to move on quickly from the pain of relegation and think for the future on and off the field, with the prospect of the Olympic Stadium in 2014/15 also a positive incentive. "The transition needs to be quick and how big that is we won’t know until nearer the start of season," he said. "But one would hope it happens quickly if it has to happen so we can rebuild the focus of the football club, West Ham and the players that are there to get out of the division. The board have said they’ll back me as best they can from a football and a financial point of view to get back into the Premier League." On any potential signings, Allardyce revealed: "Like every manager whether you're new or established, what can you find for the football club to make it better than it already is? We'll all be hunting around for players in this small period of a window that's open until the end of August. It always makes it a very frantic time and for me of course it makes it even more so when you're finding out about everything else. You're finding out about the players you've still got, the staff that are still there and you're trying to put your ideas into place as quickly as possible and make that transition as smooth as possible to get a team playing as a team. Often, with such a big transition you could end up with a team that plays as individuals, not as a team. That's the dangerous point, the early part of the season because everybody expects that from the 6th August we're going to go out and start winning immediately. We hope we can do that, we'll do our very best but sometimes it might take a little longer depending upon how late the ins and outs come." When probed on the club's internal transfer policy, the new man insisted he would work with David Sullivan. "He's very knowledgeable in the football world and has done [this] for a number of years at Birmingham," he told the radio station. "My discussions and recommendations go to him and we'll try our best to secure the player. But I'll have the final say, it's not a football club I think that drops a player on your door that you don't know about, I don't think that's going to be the case at all." It has been ten years since he last worked in England's second tier, but Allardyce insists he is well prepared. "The Championship is a 46 game season and there's a much greater demand physically and mentally because of the extra games," he said. "You've got to plan for Saturday/Tuesday throughout the season rather than Saturday to Saturday as you do in the Premier League. The focus of training, recovery, nutrition, strength, conditioning, psychology is all very important. I break the season up into four [sections]. The excitement of the start of the new season when everybody's raring to go and then the winter months kick in. Then Christmas, when the training programme changes somewhat and then there's the big push at the end where you relinquish the physical aspects and focus more on the organisation and the mental [side] more to get the ultimate push. A big one always today for eveybody is how you can prevent injuries, how you can have fewer injuries than anybody else. I'm a great believer that the greatest opportunity to win football matches is when you have your best players available more than the opposition teams, as that'll give you more chance to win." The backroom support has always been a key element of an Allardyce regime. To that end, he revealed: "I've already started with Neil McDonald as I did at Blackburn. The rest of the staff at West Ham for me is about working with them, them working with me and we'll see how that develops. I had a very good team I built at Bolton but they moved on to better things when I went to Newcastle and now are all established in the Premier League. So from my point of view it's not about taking lots of staff that I know with me but finding new members of staff that can live up to my expectations. I like the areas and the departments to have a highly-qualified member that runs that department and for us all to pull together for the one goal - to get the players on the field to play the best they possibly can." Mindful of the club winning just two of the last 37 away league fixtures, Allardyce will naturally focus all of his attention on playing matters. He reiterated his determination to make the Hammers successful wherever and whenever they play - but will not sacrifice the club's traditions in the process. "I know there will be West Ham fans asking whether I'm going to abandon the style of play that's been the club's heritage over the years," he admitted. "All I'll say is it will be a tale of home and away. At Upton Park we'll attempt to play the kind of passing game the fans want. We will aim to continue in the same way on our travels but we'll also be tough, hard to beat and utterly resilient." Of his reputation for a long-ball style, Allardyce added: "I’ve had that long, boring tag with me for many years and it will always crop up for me now, unfortunately. If people cast their minds back to some of the teams I’ve managed, it’s a bit of a nonsense but I can’t relinquish that tag. I’m well aware of the type of football West Ham play, but have they played that recently? Realistically they haven’t , because they’ve just been relegated. How they play will be at the forefront of my mind but it has to be a winning style and my last ten years in the Premier League has proved that." Julian Dicks is convinced Allardyce can revive the club’s flagging fortunes – providing he is giving the funds to rebuild the squad. Dicks told the Alan Brazil Sports Breakfast: "I’d like to think they could bounce straight back, especially with Sam there. It depends what players he gets in. If he can keep quite a few [of the current squad] there’s no reason why they shouldn’t get promoted in the first season. There’s no excuse. The parachute money is there, let’s hope he gets it. If he does and spends it wisely I’m sure they can get promotion straight away." Dicks feels Allardyce is just the man to inspire the under-performing East Londoners and insists the fans won’t mind the style of football as long as it brings success. He added: "Allardyce will give them a kick up the backside. There were a lot of under-achievers at the club last season and Sam won’t put up with that. The teams he’s been involved with work hard and fight for everything. It drives me crackers, but that’s football today. It’s not just West Ham, there are quite a few teams like that who don’t have the desire to work hard. But if you’re at the bottom you have to work a lot harder than most teams. The fans will relate to him instilling that fight. And I tell you what, I’d much rather be halfway up the table playing the football Sam plays than at the bottom playing free-flowing football." Tony Gale believes the new West Ham boss can deliver the stability that was lacking from the club under Avram Grant. The Israeli was viewed by many as a weak figure in the dressing room, something that was only added to by the side’s poor performances on the pitch. Gale told Sky Sports News that Allardyce will have the strength to run the club properly, saying: "Avram Grant was weak and was listening to too many people in the background. The owners, Karren Brady, Barry Silkman are involved with the club as well. And when you start listening to everyone else in the background and you’re not making your own decisions that’s the worst thing in the world. At least someone like Sam [Allardyce] will have the strength of mind and the strength of character to deal with everyone. It’s been run like a bit of a holiday camp. The only difference is there hasn’t been any entertainment. Sam will be a welcome addition because he might smack a few backsides and get these boys playing because there is no doubt there is some ability within that squad." Finally, Alvin Martin, who made 469 appearances for the club, added that he was delighted with appointment despite some fans reservations. "I think [the appointment] is pretty positive. I know that some West Ham fans have been a little bit uncertain about the appointment prior to it happening. But he is the right sort of man I would have expected [to be appointed] as he has got the right credentials to take them back up. The priority is getting them back up. "When I look at what went wrong this year I think Avram Grant was a lovely feller, he had a great rapport with the players, I’ve got no doubt about that but did he demand enough from the players. That was always my question, did he demand, did he push, did he bully them into performances sometimes and if they did fall short was he going to let them know. I don’t think he did that and big Sam will. He has got a track record for getting the best out of players. They’ll be organised, they’ll be disciplined, they’ll be hard to beat and he’ll have better players in that division than most of the other teams. I think he will get them up I’ve got no problem with that whatsoever and I think it’s a really positive appointment."